Our next 12-week session of greens will start in mid to late September! Official start date will be determined based on September's weather. If you are new to weekly greens, please contact us directly before signing up, to make sure there is room before you pay! "It is clearly a high quality product, it is obvious from the first taste. There is nothing comparable in the produce section of any grocery store chain." "Before becoming a customer of Bloomfield Farm, my salads used to be full of veggies, fruit and dressing. After buying Bloomfield Farm's greens my salads are often just greens by themselves....no dressing even. They're that good. Sometimes I eat the leaves right out of the bag like chips, no bowl needed. Fresh, crunchy, juicy and often spicy, you can taste the love Rebecca gives these plants." "I was totally satisfied with our greens. Not only were they very fresh but the variety was wonderful. It is so great to have organic greens that taste awesome and are grown by a local person at our convenience. Thank you very much!" "We love these greens! Great selection and so fresh! They last longer than any other greens we have ever had...so nice to have such a great product bought locally." 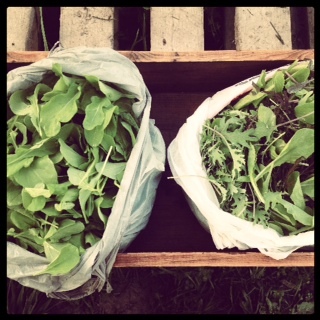 "We enjoyed greens from Bloomfield Farms this spring and looked forward to picking them up every week. It was a pleasure to have access to food grown locally, mindfully and with love. They simply taste better, stay fresh longer and nourish the body and soul with a quality of nutrients and life energy that is hard to find these days. Can't wait for the fall greens!" WHAT TYPES OF GREENS WILL I RECEIVE? It will vary from one week to the next depending on which greens are at their peak harvest stage each week. This means that you will always get a mix of what's most delicious from the farm each week. See this document for an example of some greens you may find in your mix! HOW MANY PEOPLE WILL THE BAG OF GREENS FEED EACH WEEK? This really depends on you and your family's eating habits. Greens addicts may get a few hearty main-dish salads each week out of the bag, and a small family could eat a small side salad almost every day of the week. Not sure how to get through all the greens? Try throwing them in a smoothie with yellow/green fruits- maybe some yogurt or avocado-- a little vanilla- maybe honey or maple syrup- hemp seeds? why not--- we could go on and on. There are more ideas where that came from, so just ask! WAIT, SO I JUST PICK IT UP AT DANDELION FOODS? You sure do. We are so excited to partner with this incredible new store in Almonte. Each Thursday, you will pick up your bag of greens at your convenience, anytime between 9 AM and 8 PM! Payment is processed through Bloomfield Farm ahead of time, so all you need to do is let a Dandelion Team Member get your bag of greens for you, check your name off the list, and you're on your way! Why not pick up your weekly groceries at the same time, and further support local farmers and your community? Dandelion is all about choosing local, and we are all about them. If you love good food and good people, we know that you will be too. I'VE NEVER THOUGHT OF A FARM AS A THING TO SUBSCRIBE TO. HOW CAN I DECIDE IF IT'S RIGHT FOR ME? Let’s talk on the phone to discuss further if you would like help determining if this is a good fit for you and your family’s needs! We really do believe that your membership will bring you so much more than salad. It's hard to put a price on knowing where your food comes from, on food that is so fresh it lasts longer than you ever knew it could, and on the health of you, your family, and your community. I THOUGHT PART OF A FARM MEMBERSHIP IS GETTING TO KNOW THE FARM & FARMER. WHAT ABOUT THAT? You are absolutely right. Members will be invited to a farm tour, volunteer day, and lunch in the Spring! This is a great chance to see exactly where your greens come from, and to ask any questions you may have. WHAT IF I GO ON VACATION, GET STUCK IN TRAFFIC, OR JUST CAN'T PICK UP MY GREENS FOR SOME REASON? Please arrange for someone to pick up your greens for you. If the greens are not picked up by you or someone you sent in your place by 8 PM on Thursday, your greens will be donated to TYPS in Almonte. Simplifying the management of distribution in this way allows us to operate more efficiently as a farm. As well, it is important to us to respect Dandelion Foods and how it manages its space. Thank you for understanding why we need to be strict about this policy. I DON'T LIVE IN ALMONTE. CAN YOU PLEASE DELIVER? PRETTY PLEASE WITH ORGANIC CHERRIES ON TOP? We're tempted. We encourage any of you who do not live in Almonte to arrange a system with members near you whereby you can pick up for each other. For example, say six of you live in Ottawa or Arnprior. Each of you can take an excursion to Almonte once every 6 weeks, and pick up for all 6 members at once (really, this is just one more reason to visit lovely Almonte; you can say hello to the waterfalls, grab a coffee or fairtrade craft at Equator, and head to Dandelion for your greens!). We are happy to link you to others in your area who may be interested in this type of arrangement, or you are welcome to recruit folks in your area who may be interested. We only offer the full 12-week option, so we encourage you to find a friend to split your share with you. Please let us know if this is something you are interested in, so we know to keep our ears open for others looking to do the same. We would be happy to link you with others interested in splitting a share. SOUNDS GOOD TO ME. HOW DO I SIGN UP? Please contact us by email or phone, or fill out the form below to express interest and verify that there is still room. We will accept members in the order in which we were contacted, and will hold your spot for one week without payment. Once you have received confirmation from us that we have a spot available for you, you may pay with cash, cheque, e-transfer, or online via Paypal (at the bottom of this page). If you are writing a cheque, please make it out to Bloomfield Farm. When all spots are filled, we will begin a waiting list and will let you know as soon as a spot becomes available! CAN I PAY ONE WEEK AT A TIME? The philosophy behind a subscription to a farm is that farmers receive payment at the beginning of the season when their expenses are the highest, and that in return we supply you with a weekly supply of fresh, local, and organically grown veggies. That said, if the requirement to make a one-time payment prevents you from being able to join, please contact us first so that we can talk though other options. It is important to us that good food be available to everyone, and that farmers receive a fair and reliable wage for their work. Let’s talk about how to make both of these possible! Interested in signing up? Have questions? Please be in touch by filling out the form below.